Southern Vietnam is an evocative land where great geological forces, proud peoples and powerful mythologies have molded a unique landscape and culture. Southeast Asia’s mightiest river, the Mekong, ends its epic journey here by forming one of the world’s largest deltas. 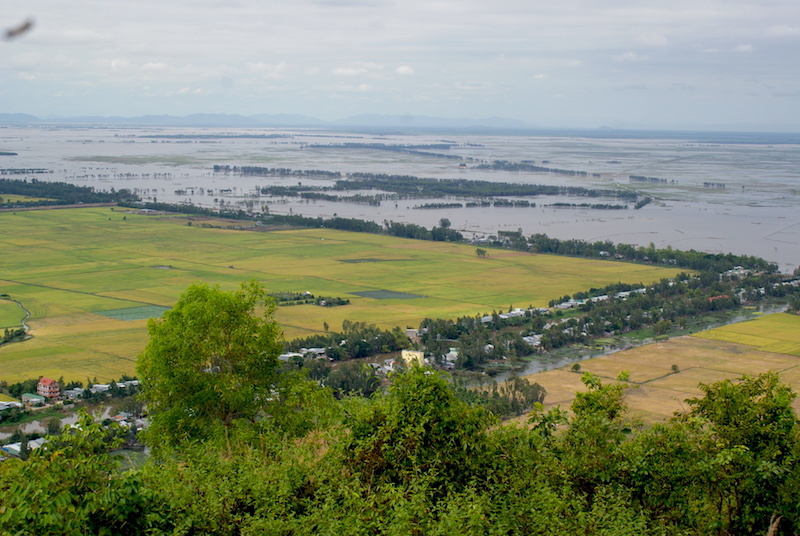 Eroded mountain remains from the six countries the Mekong flows through enter the delta as nitrogen rich silts and sands that support the “rice bowl” of Vietnam – the largest population living on a delta in the world. River sands washing out to the South China Sea are then swept northward by currents and blown back inland to form dramatic dunes. Students on this learning adventure will see with their own eyes the amazing geological forces of wind and water that reduce mountains to sand and silt and reform them again under pressure to form sandstone, shale and slate. They will learn how river silts expanding seaward 80m a year support intense agricultural production and how the nine channels of the river delta give rise to the Vietnamese name for the Mekong: Song Kuu Long – River of Nine Dragons. After several days touring the delta by boat and bicycle students will travel up the coast to enjoy some of Asia’s most dramatic sand dunes and historic sites. 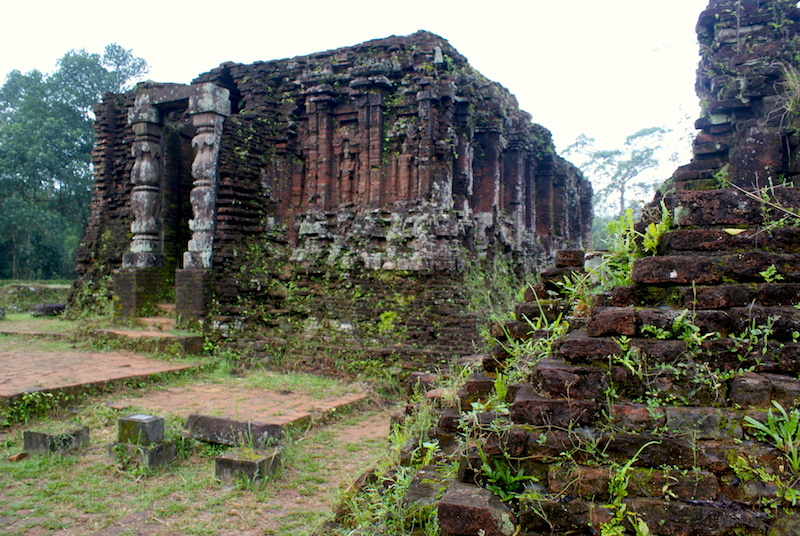 Riding the Reunification Express Train north to Da Nang, they will then visit two UNESCO World Heritage Sites – the ruins of ancient My Son, the holy land of the Champa Kingdom, as well as the idyllic and historic trading port of Hoi An. Here, amidst the ancient carved stones, temples and hanging lanterns, students will see countless dragon images – stylized impressions of a real life Mekong River fish that gave birth to belief in the “Naga” or dragon. Looking for a living classroom to tie together lessons in science and humanities with never-to-be-forgotten experiences? This is it! Students arriving at Hoh Chi Minh International Airport will be greeted on arrival and transported by mini vans to the Mekong River Delta town of My Tho. Checking in to the Chuong Duong Hotel with its superb riverside location, we will enjoy a welcome dinner, a trip orientation session and a formal discussion on the geological and human history of the Mekong River delta. From our rooms overlooking the Mekong we can spot early-morning swimmers exercising in the river and watch the bustle of boats arriving with produce for the morning market. We’ll head to the fish market ourselves for a quick lesson in biodiversity. Only the Amazon and Congo rivers have species diversity greater than that of the Mekong. After breakfast we set off in small wooden vessels and travel through a maze of small channels connecting charming rural villages to get a glimpse into the rural economy of the delta. Dragon Island with its lush, palm-fringed shores will be our first stop. Well known for its longan orchards, this island is also home to shipwrights that craft many of the wooden fishing boats lining the shore and plying the waters. With a little luck, we may get some basic lessons in boat building. Nearby Unicorn Island is home to villagers that produce coconut candy and banana wine. Here students can watch huge cauldrons of sticky coconut syrup being poured out on slabs to cool before it is cut into strips. They can then lend a hand cutting the taffy into small pieces and wrapping it in paper to take along on our trip. At mid-day we will go ashore on Tortoise Island to enjoy lunch under the cool shade of a thatched roof restaurant surrounded by ponds of water hyacinths. 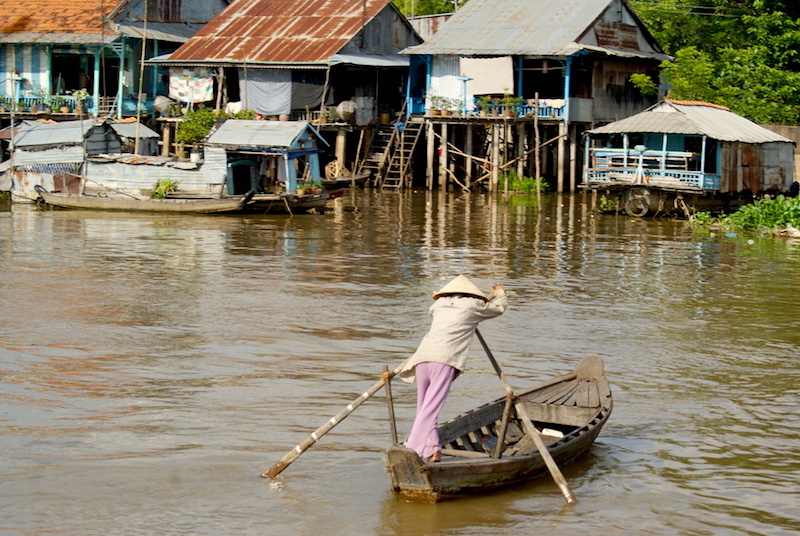 Returning to My Tho by boat, we will board our minivans and drive deeper into the delta to the town of Vinh Long. Here we will board boats for an afternoon cruise through the many islands that grace this region of the river. Most of these islands are dedicated to producing the cornucopia of fruits that find their way to Ho Chi Minh City and markets throughout the world. Students will have opportunities to not only see for the first time how these fruits are grown but to taste them. Especially delicious are: papaya, pomelo, pineapple, starfruit, custard apple, mangosteen, jackfruit, longan, guava, durian, lychee, mango, star apple and dragon fruit. Sunsets over the Mekong Delta are legendary and we will enjoy the play of colors between water and sky as we cruise to our homestay for the night. One of the cultural highlights of this trip will be spending a night and sharing our meals with a friendly Mekong family that has lived for countless generations on stilt houses above the delta. Sitting around candlelight with our host family after dinner, students can rely on our Vietnamese translator and guide to help them delve deeply into the mythologies of this region. Everyone rises at first light this morning, along with the household, to eat breakfast and head to the floating market. The Cai Be Floating Market starts at 5:00 am and we want to be there early to see it at its bustling best. Wholesalers on big wooden boats moor here each morning, each specializing in just a few types of fruit or vegetables. They display their produce by hanging it from tall wooden poles for all to see. Buyers, often rowing upright in small wooden boats, ply the busy channels selecting everything they need for the day or week. It’s a fascinating process to see. From the market we will drive east to Ben Tre to enjoy lunch aboard a multistory barge moored in the river. The cool river breeze will offer a delightful respite from the midday heat. Following lunch we drive on to the San Chim Vam Ho Bird Sanctuary for a boat tour of this famous wetland rich in bird species. Herons, storks, egrets and kingfishers are among the many species we should spot here as we learn about the vital role estuaries play in wildlife protection and as nurseries for marine life. Our hotel this evening will put students back into the comfort zone they more used to following our homestay. A modern new hotel with well-furnished rooms, en-suites and a swimming pool will offer pure bliss. Following a delicious dinner this night we will gather at the poolside for a group forum on Mekong River conservation issues and the impact multiple dams now being built will have on restricting silt flow for farming and blocking fish migrations. We depart our hotel after a leisurely breakfast and bid farewell to the delta as we travel 2-hours to the great historic city of Ho Chi Minh (formerly Saigon). Fasten your seatbelts as we enter the frenzy of this city that pulsates with vitality and life. Depending on the interest of the group we will have time here to take in one of the major attractions before lunch. Feature attractions include the Ben Thanh Market, War Remnants Museum, Reunification Palace, Museum of Ho Chi Minh City or the History Museum. We will enjoy lunch at a restaurant set in the airy loft of an old French-era shop-house. The staff at Huong Lai is all former street kids that receive training, education and a safe place to stay until they land jobs in city’s many restaurants. Following lunch we have another 2-hour drive to the beautiful coast of Mui Ne where we check into a hotel on the beach for some fun in the sun. Our beachside resort tonight offers a refreshing and quiet oasis from the hustle of the city. Set amidst extensive gardens, our cottages are spread out and a large pool offers a good swimming alternative should the surf is too large to safely swim in the sea. We will dine on fresh seafood tonight and have a group, candlelight sharing-circle on the beach before retiring. Today we enjoy a good breakfast before setting off on foot to explore some of Southeast Asia’s most beautiful sand dunes in the early morning light. Very close to our resort a stream called Mui Ne Fairy Springs emerges from the dunes. These shallow waters will be our barefoot walkway in the sand to reach cool, clear waterfalls and lovely sand dunes. Ox carts also use this streambed to transport produce. 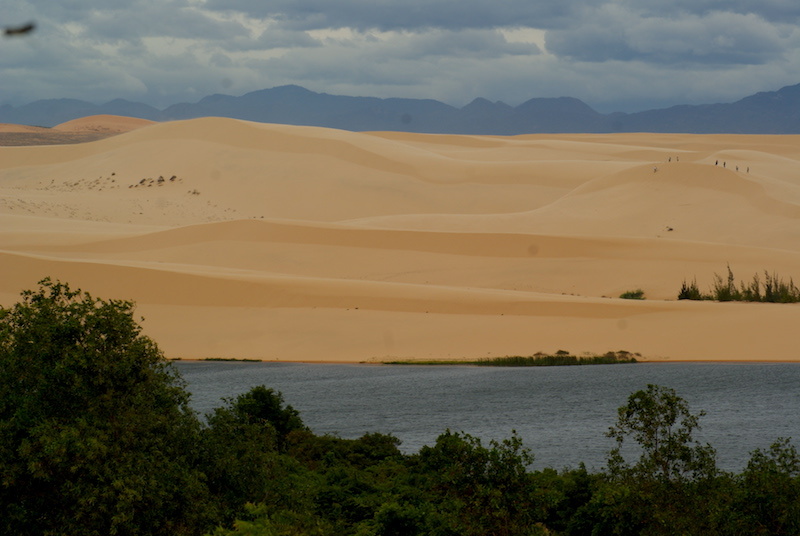 Further north of the fishing village and resort town of Mui Ne, there are even more extensive dunes that rise up from the landscape like the great ergs of the Sahara desert. We will take time to hike these red and white sand mountains, to learn how they continuously form and move and study the delicate ecology of dune flora and fauna. At mid-day we retreat to the shade at the edge of the dunes to enjoy a picnic lunch before driving north along the Cham coast of culture. The Cham were a Hindu warrior tribe that conducted raids along the entire coast of Indochina and occupied the central coast of Vietnam from the 2nd to 13th centuries. As they were in a constant state of war with the Khmers to the south and the Vietnamese to the north they erected fortress towers all along the coast from Phan Rang to Danang. On our drive along the coast to Phan Rang we will explore a number of these impressive towers with their strong reflections of Indian art and culture. Arriving at Phan Rang in the late afternoon we will dine on local specialties including the delicious grapes produced in this region before boarding a northbound train. Two-hours later we arrive in Nha Trang and transfer to the Reunification Express overnight train to Danang. Comfortable sleeper cars are provided for this 10-hour journey along the historic Cham coast and there is a wealth of history for students to learn about this rail system that links Hanoi with Ho Chi Minh. Waking up this morning as we pull into Danang we will see the famous China Beach where US Forces first landed ground troops in the Vietnam War. The short drive from Danang to Hoi An takes us along miles of palm-fringed beaches where we will stop to stretch by learning some basic moves of the ancient art of Tai Chi from our Vietnamese guide. 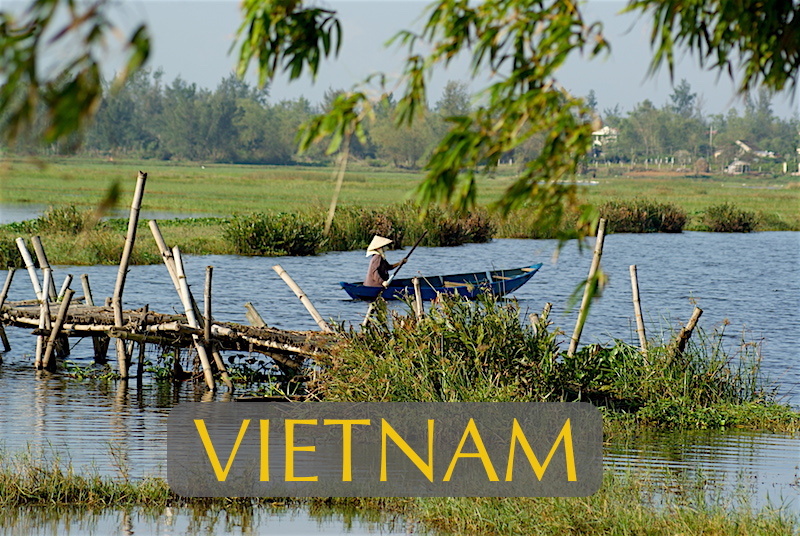 Arriving in Hoi An we will check into our hotel and enjoy a hearty breakfast before setting off on a walking tour of this charming old city that was spared from bombing during the Vietnam War. 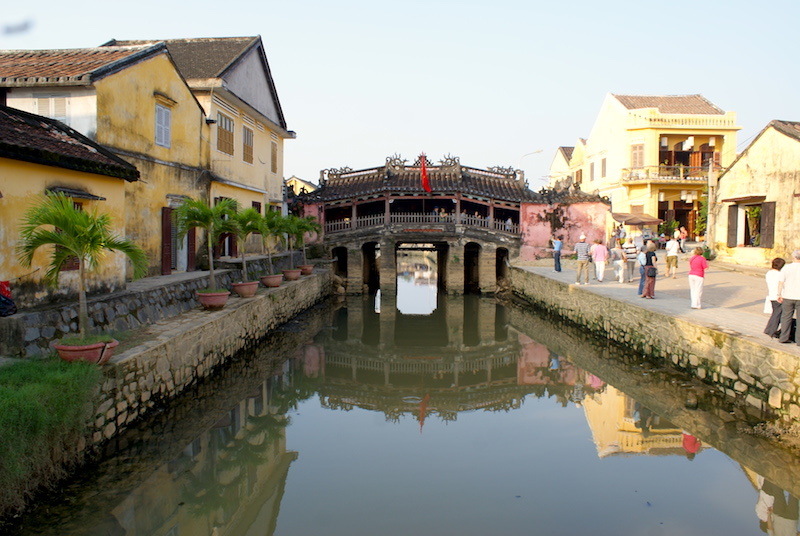 Now designated a UNESCO World Heritage Site, Hoi An was a major trading center in Southeast Asia between the 16th and 17th centuries, welcoming Dutch, Portuguese. Italian, Chinese, Japanese and merchant vessels from the Far East. The influence of many cultures can be seen throughout the riverside streets where more than 800 historical buildings have been preserved. Following our walking tour we will stop at the market to select produce to cook our own lunch. Local chefs will teach students how to prepare Vietnamese spring rolls, noodle soup and other classics. After some time at the beautiful poolside of our hotel to beat the mid-day heat, we will set off on a bicycle tour of the scenic countryside to see village life close up. Returning to the ancient city before sunset there will be time to freshen up before walking through the magical streets adorned with lanterns for a riverside dinner. Hoi An is like a magical fairy tale kingdom at night with its beautiful illumination. If our visit here should fall on a full moon, the city will be totally aglow with lanterns as Hoi An honors this monthly occurrence. We wake very early this morning and enjoy our breakfast before driving 55 km to the ruins of My Son, once the most important intellectual and religious center of the kingdom of Champa. My Son is magical in the early morning light. The ruins are set in a lush jungle valley surrounded by the babble of streams, the songs of birds and overlooked by towering Cat’s Tooth Mountain. Walking along the enchanted paths that wind their way through the overgrown ruins, students can make their own discoveries, seeing architectural influences from Cambodia, China and India as well as delicate carvings depicting deities and dragons. We will enjoy a picnic lunch at this site before visiting a local rural school for an afternoon service project. International students can make donations of school supplies and offer simple lessons in world geography by marking their country of origin on a map of the world to be donated to the school. Furthering the bond of friendship between nations, they will engage in painting a peace mural together with the Vietnamese children on a school wall. The mural can depict the Earth surrounded by many handprints, each bearing the name and country of the guest students. Returning to Hoi An in the late afternoon, we will have time to rest, catch up on journals and prepare for our final night together. Traditional music and dancing and the awarding of certificates to each student will follow a beautiful banquet held in the resort garden beside the river. A candlelight circle where each person can share his or her favorite memories of the trip will close out the evening. Right after breakfast this morning we check out of our hotel and transfer to Danang International Airport for the return flight home. School groups that cannot make connections through Danang will take a short domestic flight to Ho Chi Minh City for their onward connections.